(i)	Non-consumers No restrictions with respect to choice of venue and applicable law. Jurisdiction of foreign courts can be opted for. Foreign law can be declared applicable. 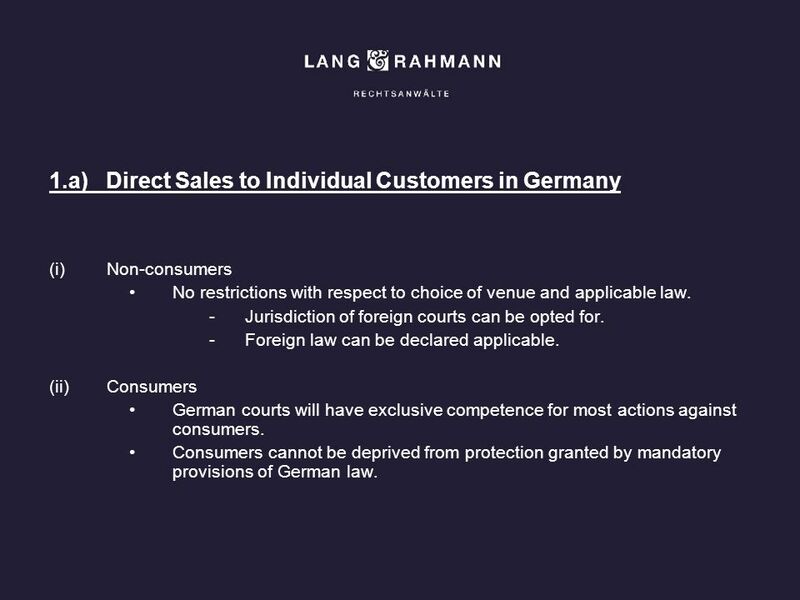 (ii)	Consumers German courts will have exclusive competence for most actions against consumers. Consumers cannot be deprived from protection granted by mandatory provisions of German law. 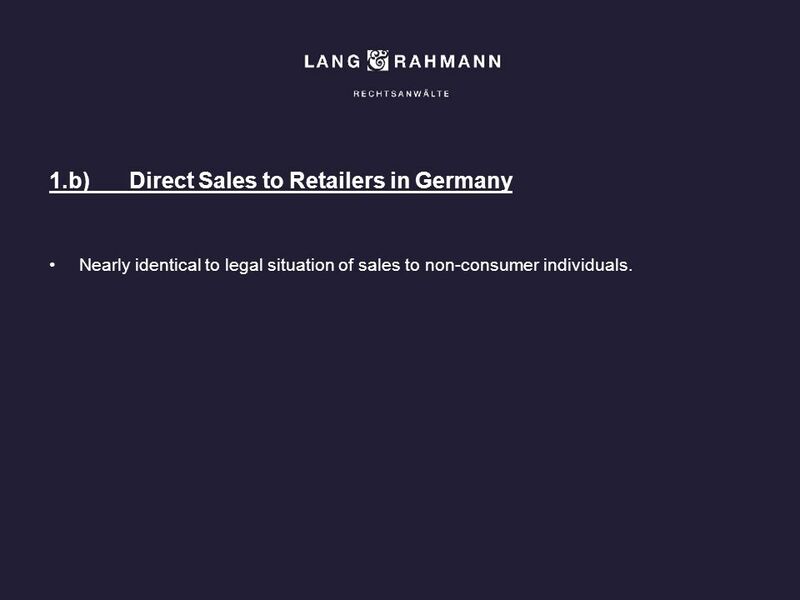 Nearly identical to legal situation of sales to non-consumer individuals. Commercial agent: independent self-employed contractor soliciting sales contracts for principal. No written agreement required, although highly advisable. German law applies, unless applicability of foreign law is agreed. However: commercial agency law has been harmonized throughout the EU. Commercial agent in Germany cannot be deprived of compensation claim at termination of contract. Principal may define scope of duties of commercial agent and can give instructions, but should not impair commercial agent’s independence. 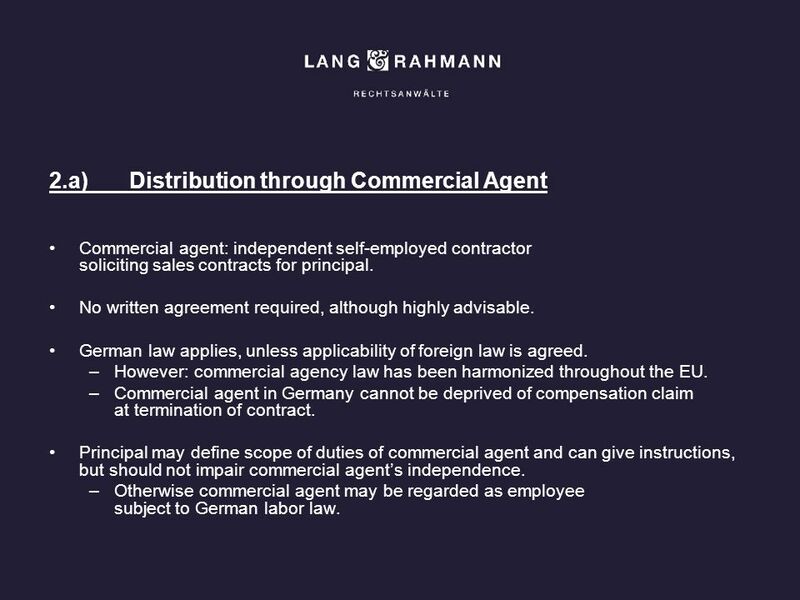 Otherwise commercial agent may be regarded as employee subject to German labor law. Claim for commission usually success fee for business solicited. may also be fixed fee or combination of both. In case of a defined exclusive territory: fee is due for every contract irrespective of commercial agent’s activity. 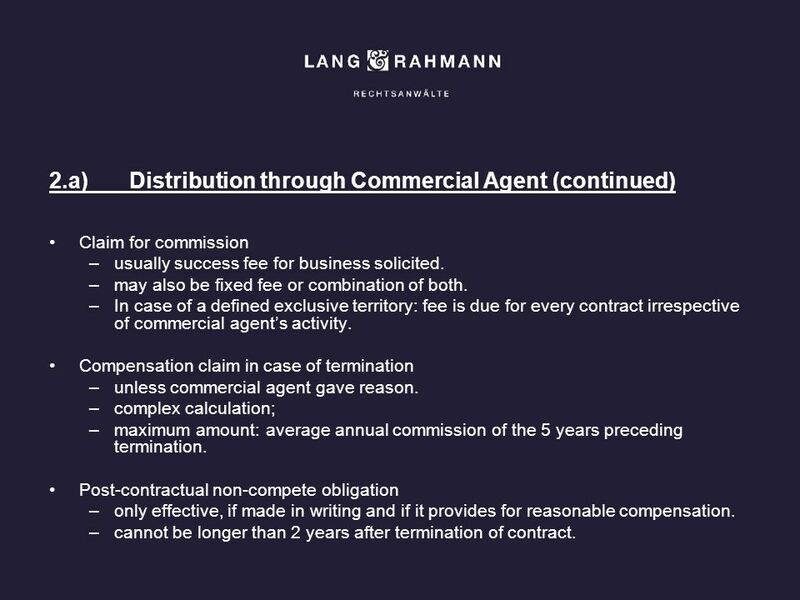 Compensation claim in case of termination unless commercial agent gave reason. 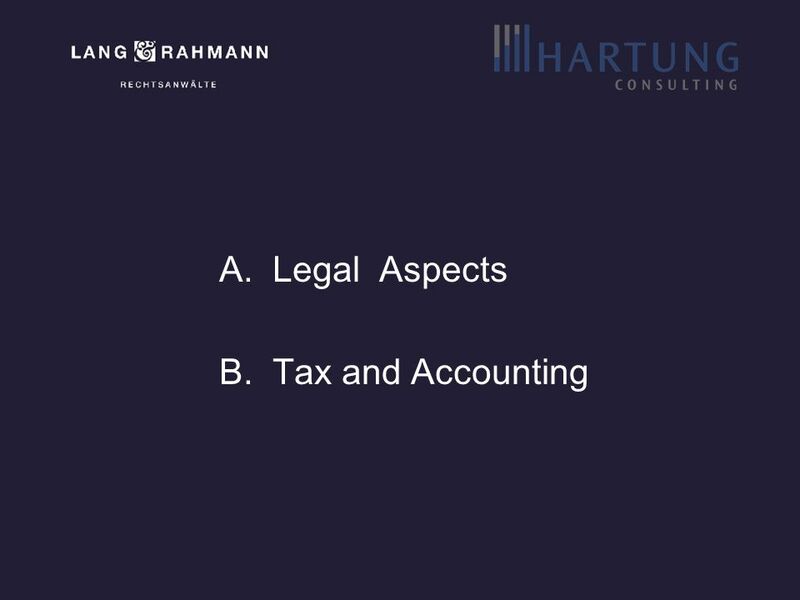 complex calculation; maximum amount: average annual commission of the 5 years preceding termination. Post-contractual non-compete obligation only effective, if made in writing and if it provides for reasonable compensation. cannot be longer than 2 years after termination of contract. Authorized dealer: independent contractor integrated in manufacturer’s sales organization, buying manufacturer’s goods and selling them in defined territory. No written agreement required. German law applies, unless applicability of foreign law is agreed No harmonization of relevant laws in the EU. 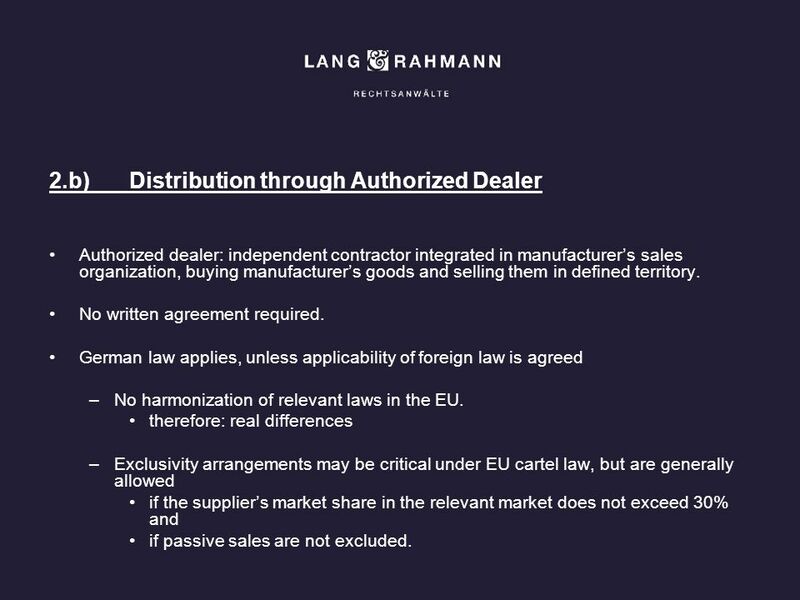 therefore: real differences Exclusivity arrangements may be critical under EU cartel law, but are generally allowed if the supplier’s market share in the relevant market does not exceed 30% and if passive sales are not excluded. 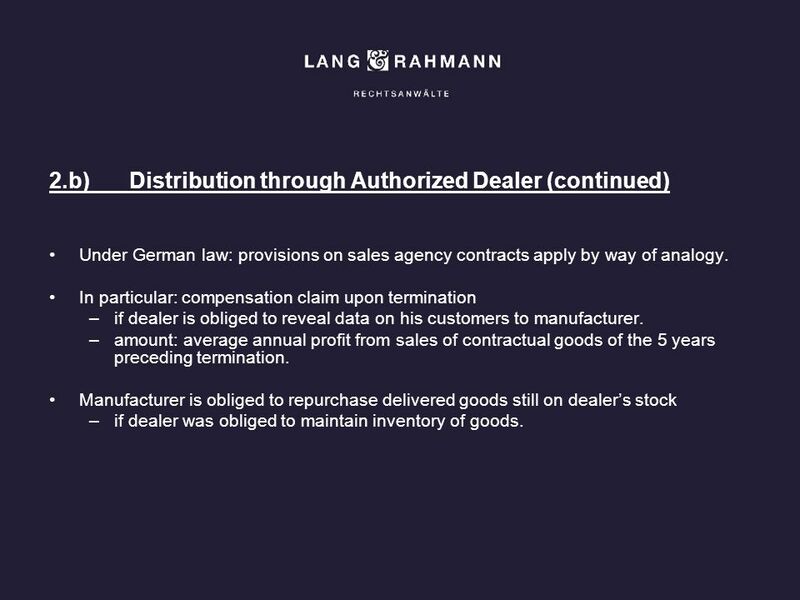 Under German law: provisions on sales agency contracts apply by way of analogy. In particular: compensation claim upon termination if dealer is obliged to reveal data on his customers to manufacturer. amount: average annual profit from sales of contractual goods of the 5 years preceding termination. Manufacturer is obliged to repurchase delivered goods still on dealer’s stock if dealer was obliged to maintain inventory of goods. 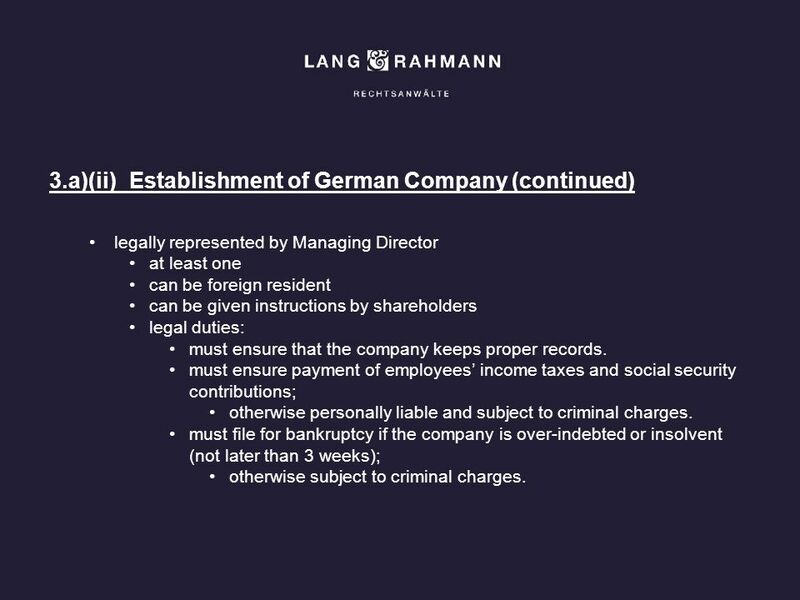 legally represented by Managing Director at least one can be foreign resident can be given instructions by shareholders legal duties: must ensure that the company keeps proper records. 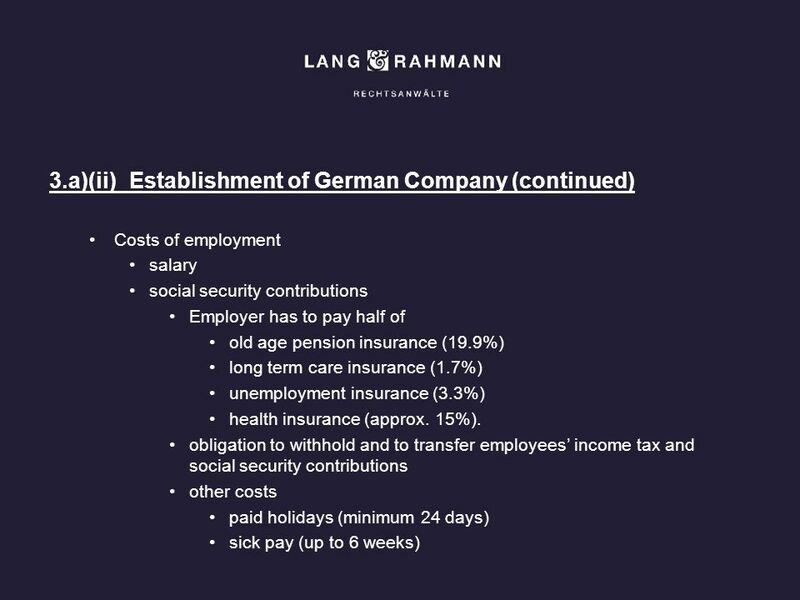 must ensure payment of employees’ income taxes and social security contributions; otherwise personally liable and subject to criminal charges. must file for bankruptcy if the company is over-indebted or insolvent (not later than 3 weeks); otherwise subject to criminal charges. 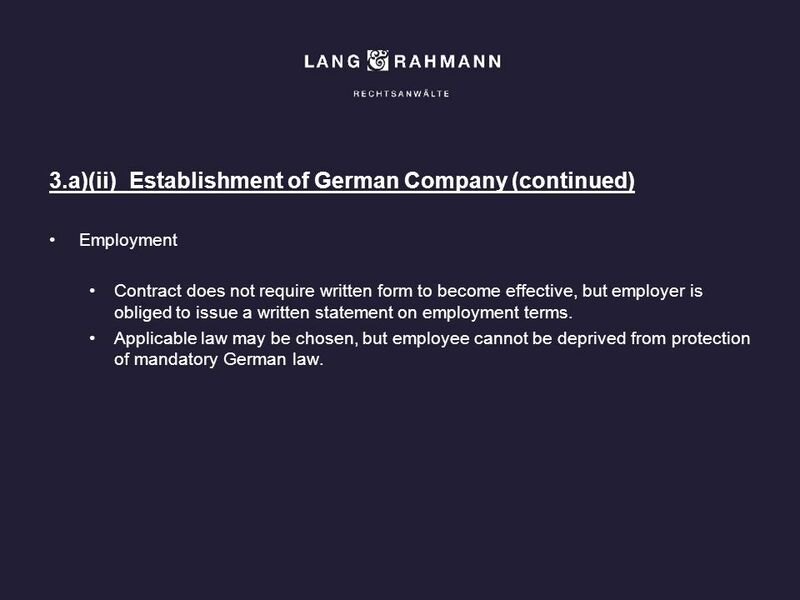 Employment Contract does not require written form to become effective, but employer is obliged to issue a written statement on employment terms. 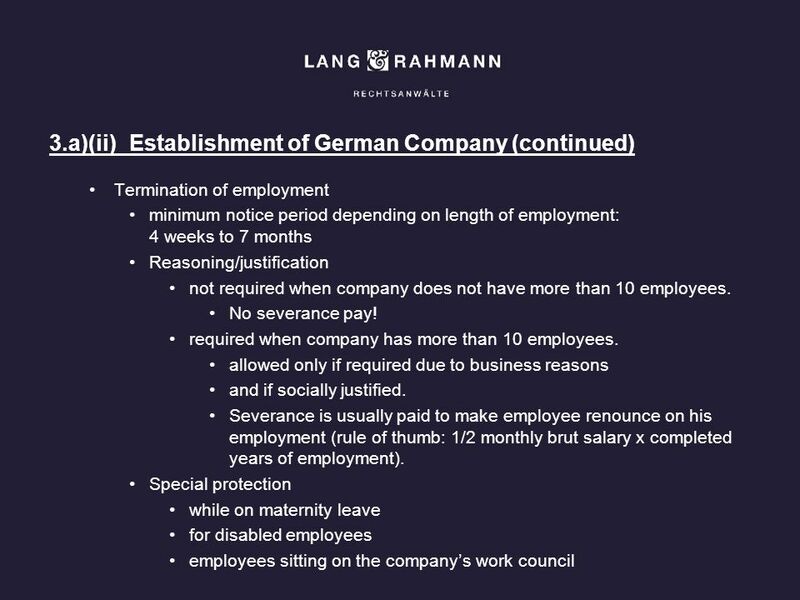 Applicable law may be chosen, but employee cannot be deprived from protection of mandatory German law. No special laws or regulations applying specifically to acquisition of businesses (except for merger control laws). 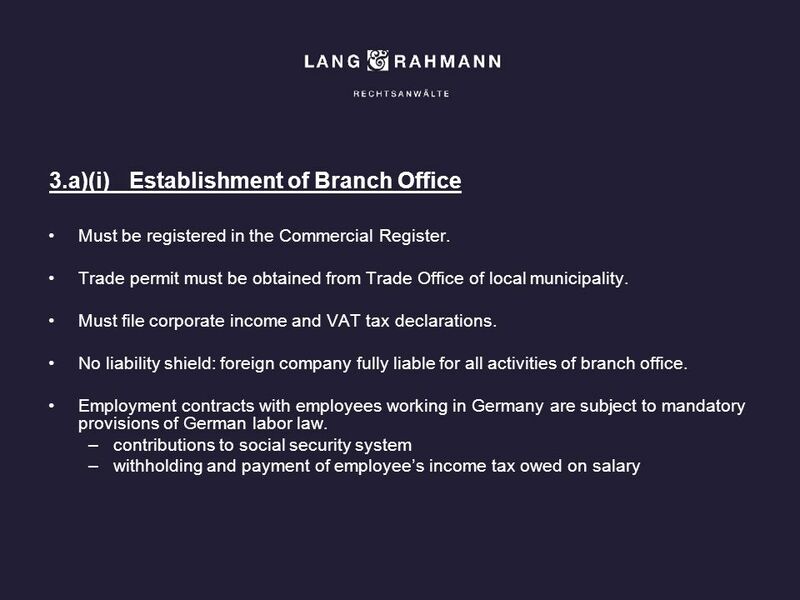 General provisions of German Civil Code (BGB) apply. Contracts subject to German law are usually much shorter and less detailed than Anglo-Saxon contracts. Unless parties agree otherwise, statutory law applies with respect to all aspects of the transaction. 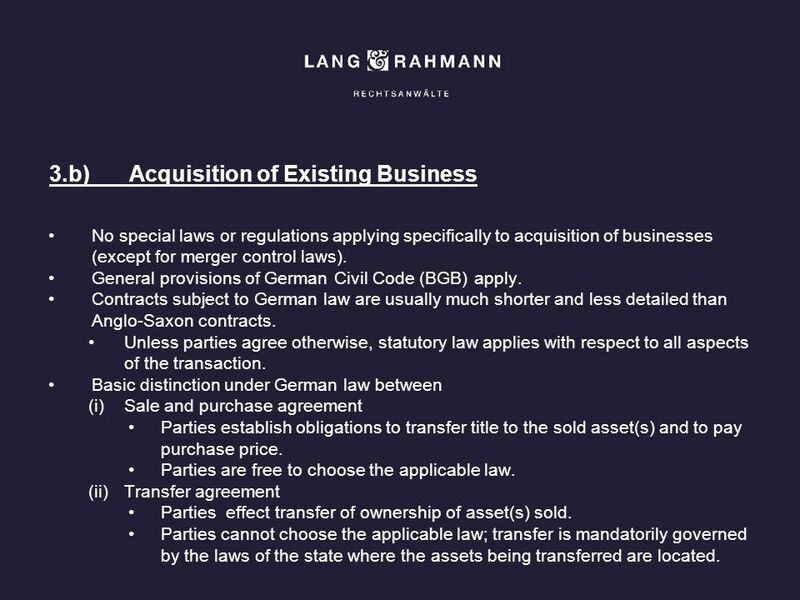 Basic distinction under German law between (i)	Sale and purchase agreement Parties establish obligations to transfer title to the sold asset(s) and to pay purchase price. Parties are free to choose the applicable law. 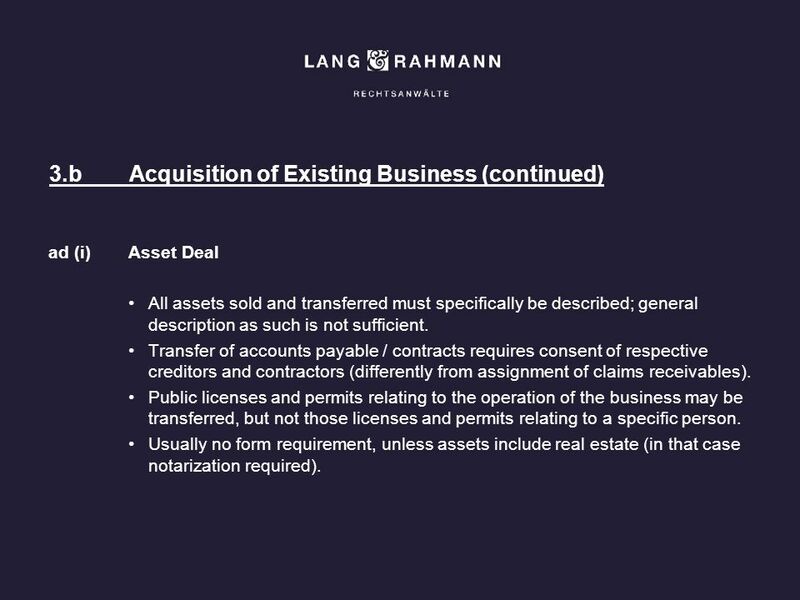 (ii)	Transfer agreement Parties effect transfer of ownership of asset(s) sold. Parties cannot choose the applicable law; transfer is mandatorily governed by the laws of the state where the assets being transferred are located. ad (i)	Asset Deal All assets sold and transferred must specifically be described; general description as such is not sufficient. Transfer of accounts payable / contracts requires consent of respective creditors and contractors (differently from assignment of claims receivables). Public licenses and permits relating to the operation of the business may be transferred, but not those licenses and permits relating to a specific person. Usually no form requirement, unless assets include real estate (in that case notarization required). Labor law: Sec. 613a BGB ! Employment contracts are automatically transferred to new owner of the business, unless employee objects to the transfer. Notice of objection can be given by employee within one month upon being notified on business transfer. Purchaser is not entitled to terminate employment merely on the grounds of the business transfer. ad (ii)	Share Deal Assets of the company do not have to be described in detail for an effective transfer, because interests / shares are sold and transferred. 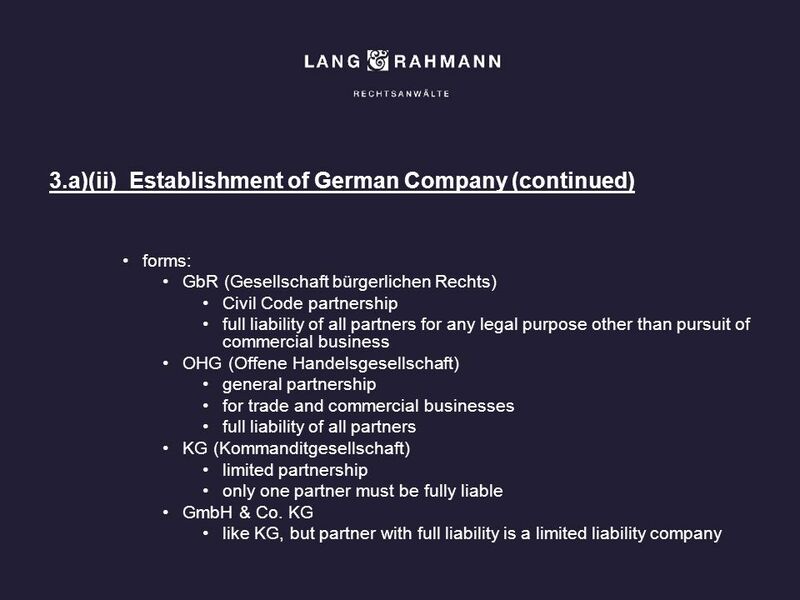 Interest in a German partnership (OHG, KG, GmbH & Co. KG) are not freely transferable; approval of all partners are required unless partnership agreement provides otherwise. 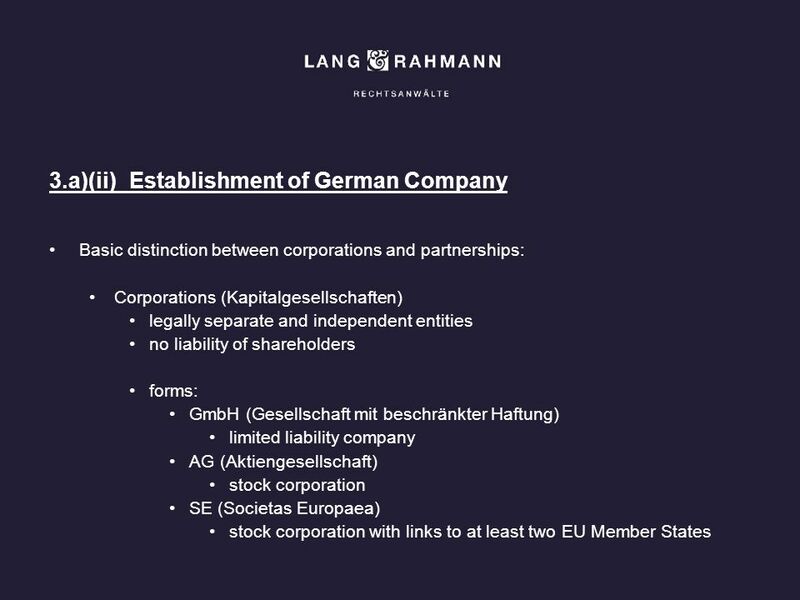 Shares in a German corporation (GmbH, AG) are freely transferable unless the company’s bylaws provides otherwise. Form requirements: Partnership and AG: no specific form requirement. GmbH: notarization required. 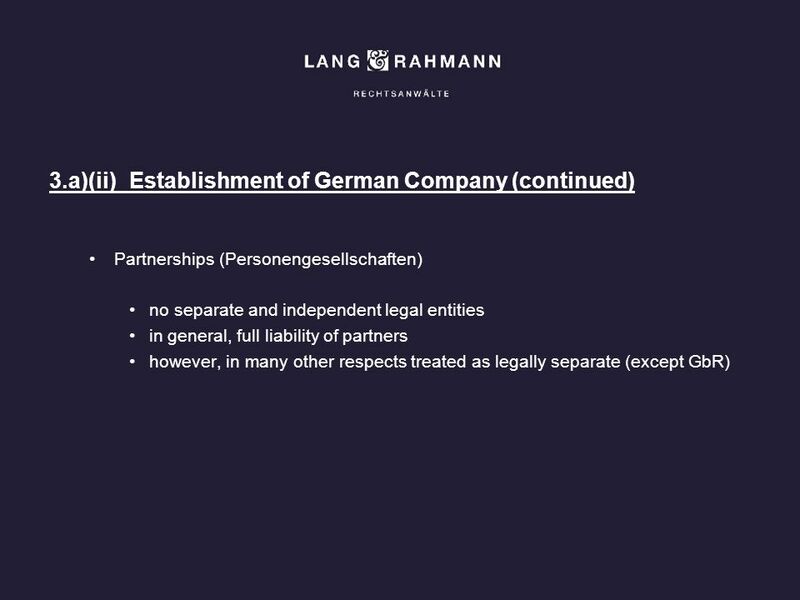 Download ppt "Doing Business in Germany"
Business Organization Intro to Business Chapter 5.
Business Ownership & Legal Structure. How Do Contractors Get Business? Three most common methods: A. Bidding on public work (competitive bidding) B. Bidding. Trade mission Hungarian construction sector 19 April 2012. © 2007 Prentice Hall, Business Law, sixth edition, Henry R. Cheeseman Limited Liability Companies and Limited Liability Partnerships. 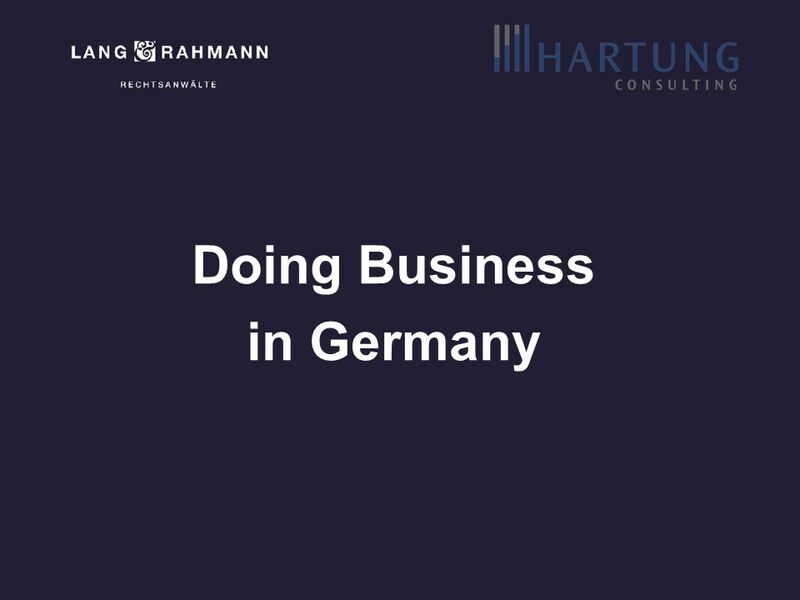 Germany as the Center for European Activity of Israeli Companies Setting up a company in Germany Dr. Mathias Reif Managing Partner Bridgehouselaw Cologne. LIMITED LIABILITY PARTNERSHIPS A Review of Legal Issues By John E. Rogers, of Burns, Fitzpatrick, Rogers & Schwartz 0. CITD Seminar - Doing Business in Europe IRONBRIDGE, LLP CERTIFIED PUBLIC ACCOUNTANTS September 21, 2004 San Francisco, CA. 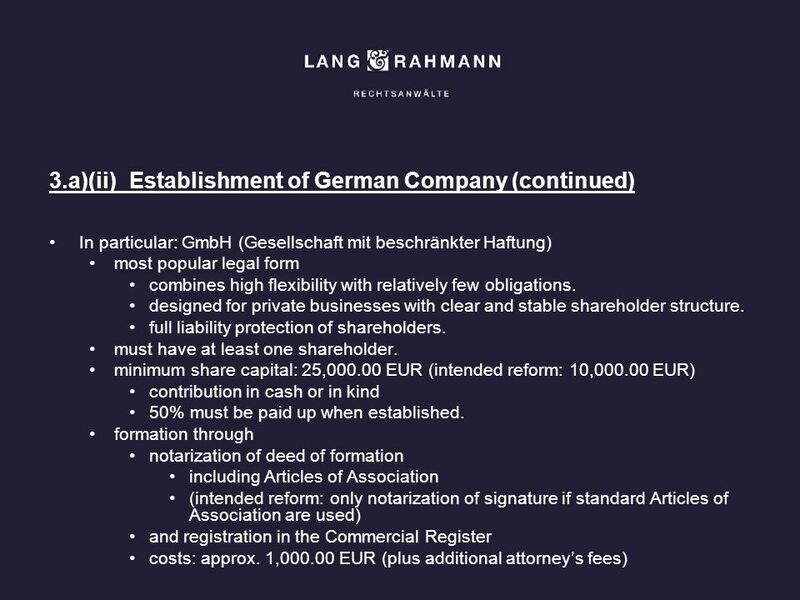 Doing M&A Deals in Germany – a summary of legal and other aspects worth knowing Robert P. Wethmar Taylor Wessing Hamburg, Germany. Ch. 5-2 Forms of Ownership.